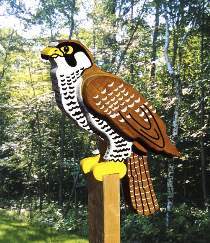 This is the falcon used in falconry, an ancient form of hunting. The peregrine can be trained to hunt other birds such as pigeons. It can dive at over 200 miles per hour to capture its prey. Now an endangered species, you can have one of these magnificent birds in your yard. Made from 3/4" and 1-1/2" stock. Plans are drawn FULL SIZE. Measures 17"L. Order Black Rounds for eyes separately below.